As we step into a New Year, it is natural to wonder what 2016 will hold… both at a very personal level, and for the world and humanity as a whole. Here, I share the Seven Cards that came forward for 2016. They tell a powerful story… A Journey of Empowerment! Transformation offers us pathway of expansion into PEACE, BEAUTY, JOY and ABUNDANCE! Surrounding this central card are 6 other cards… like points of a star… they shine before us, guiding our way, offering clues to the possibilities that lie ahead, and how we might maximize the opportunities that will present themselves during the year. Feel within your Heart and Mind who you choose to Be, and allow this to manifest! This means we have a choice, and taking time to consider what this might be sets an important foundation for the year ahead. Feel and express JOY within your Heart! Joy is a trusty guide, helping us to know when we are on the right track. What brings you JOY? Is joy present within your life, or has it become buried so deep you have forgotten it is there? This year, 2016, is a time to find the seeds of JOY held deep within your heart and help them to expand exponentially into all aspects of your life. You are fully supported as you find your own unique path! 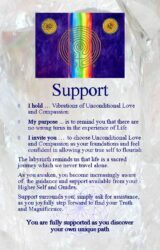 This support is an overall Universal Support from Angels, Guides, together with friends and family who truly understand us. It is a great card to have stepped forward, one I am always delighted to see in any reading. Support is always available if we seek it! 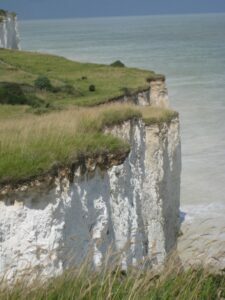 Deepening INSIGHT leads to the next steps on your life journey! 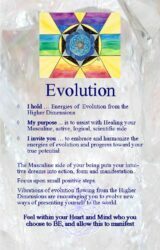 This card signifies a new phase, new higher levels of consciousness, and awakening of spiritual DNA. A deeper understanding of the “big picture” brings a new perspective to daily life. Together we are the Sunrise of the New Golden Age! The Abundance card holds vibrations of Joy, Prosperity, Expansion and Support encouraging us to confidently allow ourselves to blossom. 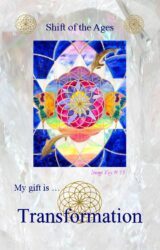 This card also emphasizes that we need to work together to create abundance in all its forms. You are LOVED more than you can ever imagine! The energy of Healing is pure LOVE, and this card encourages us to gently open our hearts and allow the vibrations of pure Divine LOVE from the Heart of Creation to enter and initiate Healing. In summary, these seven cards represent a truly inspiring storyline, which we can all experience, relate to, and benefit from, in our own unique way. Begin by remembering that we are so much more than we can currently comprehend… that we have a vast potential , which we are only just beginning to explore. Healing is the reclaiming of our Wholeness. Healing begins on levels beyond the physical. As we connect more with our spiritual self, the “knowing” of our Wholeness is seeded into our awareness. A growing sense of Wholeness can then be brought to our emotional and mental selves… helping us to release past hurts, traumas and fear. The healing vibrations from reclaiming our Wholeness can then manifest in the form of increased physical health and overall sense of wellbeing. It is a journey of Transformation and Empowerment. We are all a work in progress, and Life presents many challenges, both within our daily experiences and on the larger world stage. As we enter 2016, let us make a conscious New Year’s decision to embrace new possibilities that we know in our Hearts are right, and let this inner knowing fuel a heightened sense of empowerment that allows us to bring the best of ourselves into the world. 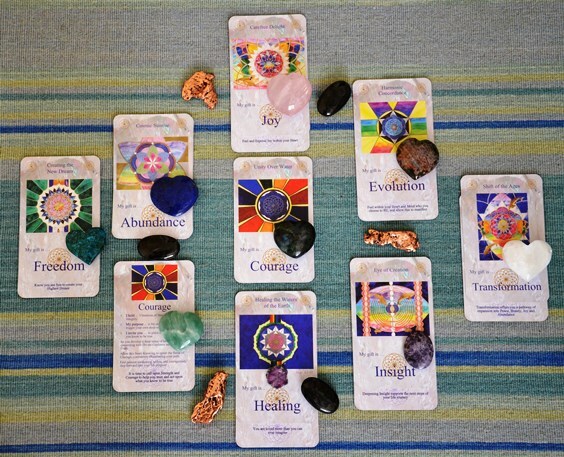 The Messages of Universal Wisdom: Empowerment Cards can be used in many different ways to provide insight, energetic support and an infusion of healing vibrations. On January 1st of each year I like to spend time with the Empowerment Cards: I ask questions about the year just beginning, and receive messages about the influential energies that will help me and others to experience the best the year has to offer. Below you will find a picture of this year’s “Activation Circle”, which highlights some of the key energetic opportunitities for the New Year. The cards which stepped forward are nothing short of sensational! The overall theme for 2015 is TRANSFORMATION … offering us a pathway into PEACE, BEAUTY, JOY and ABUNDANCE. The past few years saw many of us sowing seeds, and preparing for the great opportunities to come. As we now move from 2014 into the New Year, the energy we bring with us is the FREEDOM to Create our Highest Dream! 2015 is an 8 year… 2+0+1+5=8… a powerful year for manifesting. It is a year in which it is important to connect with our True Self, our Inner Essence, and our Knowing of what is TRUE for us. This inner knowing enables and empowers us to step forward with COURAGE to live our lives in an authentic way, sharing the LOVE, JOY and ABUNDANCE that is held deep within our hearts. It is clear from the Empowerment Cards coming forward this year within the Activation Circle, that COURAGE is an important theme for the year. COURAGE activated through LOVE and JOY will bring HEALING, ABUNDANCE, EVOLUTION and greater INSIGHT. This will lead to 2015 being a year of great potential and TRANSFORMATION, with new levels of consciousness offering to take us into the next phase of our sacred life journey. What comes to you? What do you feel? Do any thoughts or insights pass through your mind? Do you sense the excitement and potential that the year holds for you? Make sure to make a note of your Intentions, and thoughts on how to Manifest them. Finally, I wish you a magnificent year of personal growth, transformation, inner peace, joy, abundance and wellbeing… remember, it’s all in the cards! A sacred journey takes you to a place of deep connection, both with yourself, and to the places that you visit. The connection occurs in the moments of quiet contemplation as you absorb the sense of the place through all aspects of your Body, Mind and Spirit. There is an energetic exchange between you and the land, or between you and the building, that leaves you uplifted and inspired. Sacred places have special energy, most frequently created by their location upon the intersection of important ley lines of the Earth, and then further enhanced by all who have visited and honored that special place over time. Earlier this summer, a family wedding took my husband, Nigel, and I back to the UK, and it became a catalyst, igniting our own amazing sacred journey. Beginning in Wales, the land of Merlyn and Nigel’s boyhood, we took time to enjoy our family and the familiar scenery… rolling hills of lush, green grass dotted with contented sheep, narrow country lanes hemmed in by towering hedgerows, and ancient stone barns and farm buildings. 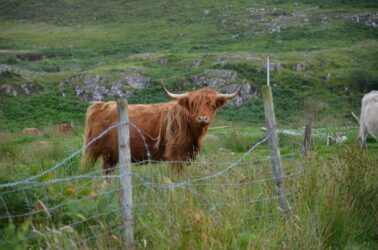 The joy-filled wedding celebrations provided the perfect springboard for our onward journey to the west coast of Scotland and our very first visits to Mull and Iona, two Hebridean islands shrouded in Mystery and Legend! Mull was reached by ferry from Oban… our departure was greeted with warm sunshine, allowing us to enjoy the subtle colors presented by the Scottish Highlands stretching into the distance, and the blue, sparkling waters of the Sound of Mull. 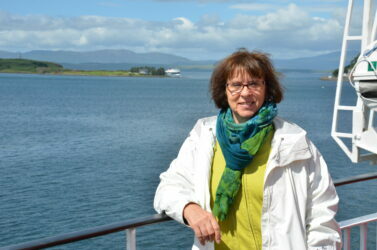 Mull’s intoxicating, rugged beauty is so special. 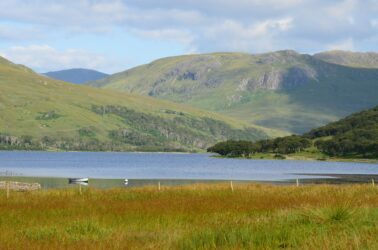 The island is defined by water: in addition to the sea, we were struck by the number of cascading waterfalls, churning streams, babbling brooks, fairy tale lochs… and by the plentiful rain! 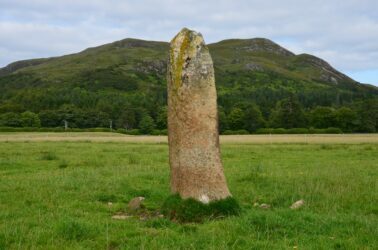 On the first evening we discovered our first standing stone at Knock, and close by the beautiful Loch Ba, with its legendary rejuvenating waters. 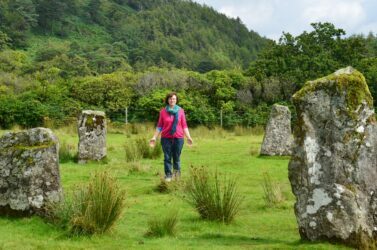 Mull has many standing stones, several of them totally unmarked, and a complete stone circle at Lochbuie. However, I had arrived on Mull with a mission… to see a stained glass window in the small church in the village of Dervaig. 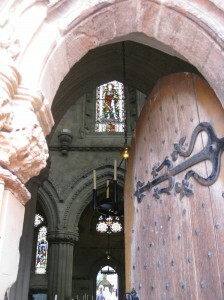 The window shows a pregnant Mary Magdalene with Jesus at her side. The colors of the glass are phenomenal, exuding a loving softness. Though relatively modern, the window alludes to one of the ancient mysteries in this part of Scotland, a mystery that can only be explored beyond the usual guide books. .. for instance, stories of Jesus and Mary Magdalene visiting these lands as husband and wife, and Mary giving birth to a son. A second ferry took us to Iona where the connection to this story becomes even stronger “for those who have eyes to see and ears to hear.” Iona is a small island 3.4 miles by 1.6 miles, its appearance and feeling so totally different from adjacent Mull. The rock that forms Iona is very ancient compared to the other islands in the Hebrides. 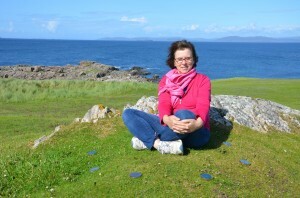 Before we set out on this journey, people had been asking what I was going to do on Iona; my answer… I just want to place my feet on the land and BE there. This makes more sense to me now. The entire island is sacred land, just being there is an energetic invitation to raise your frequency and consciousness, and to release any burdens you have been carrying. It was clear from the outset that our journey was being guided from the higher dimensions, and as we arrived on Iona I was prompted to bring the Empowerment Cards and Eden Healing Discs out to play. These tools provided added insight, helping us to fine tune our focus and intention as they supported our journey and experience, encouraging us to go deeper into the energy of the specific sacred sites we planned to visit on the island. 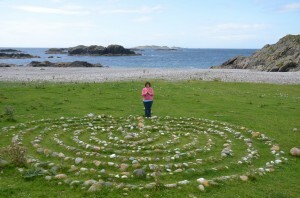 We began our exploration with the Labyrinth at St Columba’s Bay. 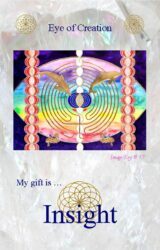 The Clarity Empowerment Card and the Heart of Love Healing Disc had stepped forward to guide this experience. A beautiful ceremony evolved with prayers to release all that no longer serves us, including the deepest wounds from within our hearts, and to fill those spaces with Divine Love, Compassion, Forgiveness and Gratitude. Next, we climbed Dun I (pr. 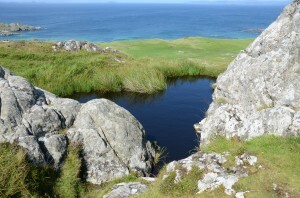 Dun ee), the highest point on Iona, and considered to be the most energetically powerful location. The climb is steep, wet and slippery but offers tremendous 360 degree views, including the Atlantic Ocean (next landfall, Newfoundland), Mull, the famous Island of Staffa with Fingal’s Cave, and the dramatic splendor of the Scottish Highlands. We were drawn to the “Pool of Eternal Youth” just below the summit. This heart-shaped, small body of brown water nestles between rocky outcrops, and promoted a feeling of deep serenity. We bathed our hands and feet, absorbing and integrating the “sense of place”. The Empowerment card for Dun I was Balance, representing the balance between Masculine and Feminine energies. 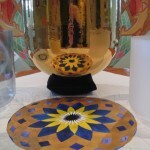 The Eden Healing Disc that stepped forward for this place was Children of Light, with its powerful affirmation… “I Choose to BE and Express with LOVE, ALL that I AM”. This is an energy that speaks to possibilities and perfections, encouraging us to step into our wholeness. Children of Light is the perfect partner for the Balance card and Dun I, the power spot of the sacred isle. 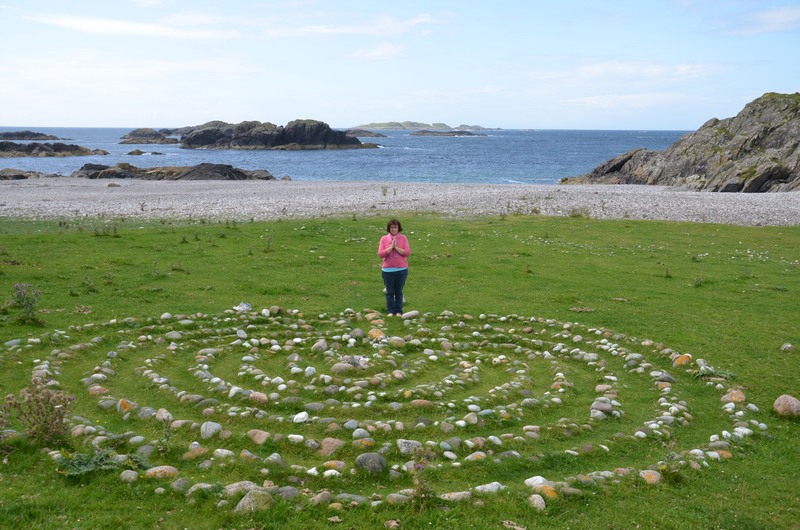 We moved down toward the beaches at the northern end of Iona, where I was guided to lay out the 8 healing discs in a circle. When either the Healing Discs or Empowerment Cards are laid upon the ground in this way they are creating sacred space… in this case it felt like we had created a mobile “stone circle” and there was a beautiful exchange of energetic frequencies between the land, myself and the Healing Discs. The Empowerment Card for this location was Insight. 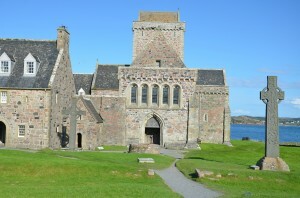 After exploring the beach it was time to visit Iona Abbey, originally founded by St Columba in 563. The Empowerment Card drawn for this location was Grace, and the Healing Disc, Temple of Power, both representing the return of the Divine Feminine energies to create Balance and Harmony with the divine masculine. The Abbey, which was destroyed during the Reformation, has been beautifully and impressively restored. I entered the Abbey having read about St Columba banishing all women and cows from Iona as he considered they caused mischief. 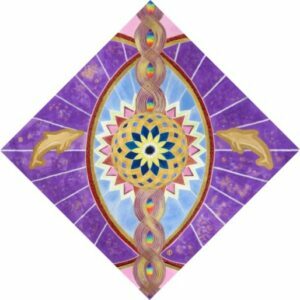 I felt extremely aware of the Grace Card and Temple of Power Healing Disc in my pocket as we walked around , sensing their Divine Feminine energies being seeded into the overall energy of the place. The deeper stories tell of how Iona was already a sacred isle before the arrival of St Columba; it was known as Druids Isle, a center of learning and power with many important visitors coming to study and receive guidance. Again, the story of Jesus’ presence upon the Isle surfaces, and it is said that those who are ready, receive tremendous benefit from the energies which exist as a direct result of his presence upon the island. The weather had been incredibly good all day…sunny and very clear, allowing us to see other islands, including Staffa, home of Fingal’s Cave, and multitudes of puffins. 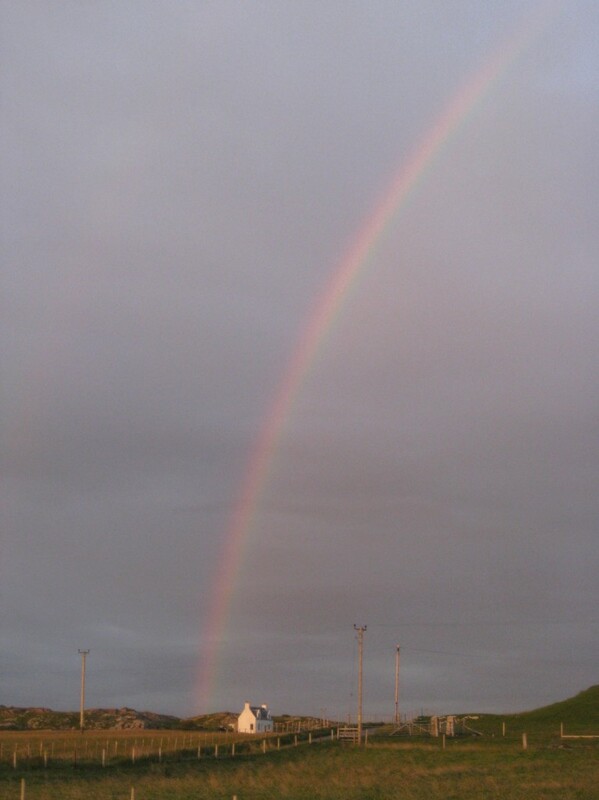 It was capped by a beautiful rainbow, which to me, in that moment, was a sign of success being delivered from the higher dimensions. 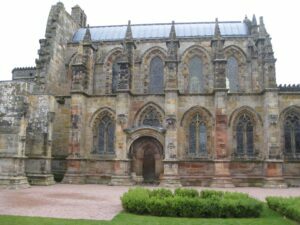 I would love to have stayed longer, however the next day we had to travel back to the mainland, for our journey to… Rosslyn Chapel! My previous visit to Rosslyn in 2008 coincided with major restoration work and construction of a new visitor’s center. 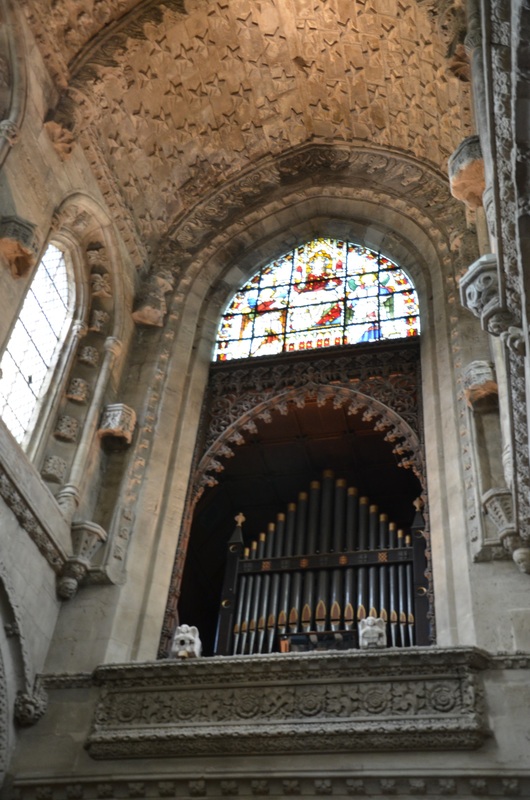 Now, with the scaffolding gone, the chapel’s true magnificence was breath taking! Inside, the concomitant sense of awe and comfort was striking. The chapel and its history are shrouded in so many stories, mysteries and legends, yet the importance is just to BE there, absorbing and integrating the energies of the place. All 8 healing discs were with us in the chapel, and the Empowerment Card that stepped forward was “Joy”! While our short, yet remarkable, visit to some of Scotland’s most sacred sites was now at an end, I had one more special trip to make before returning to the US… the English county of Kent, and in particular the famous white cliffs of Dover, overlooking the English Channel and France. Here, my sister and I, spent some quality time walking our favorite ancient paths with the sun on our backs and blustery wind in our faces – a truly exhilarating experience, as always! Finally, a huge thank you to the Guides that accompanied us this summer… I am already looking forward to the next chapter of our sacred quest in the UK, and their continued inspiration and guidance! As we move into 2014, I feel a shift in the energy, a feeling of lightness, possibility and potential! I am a healing artist. It is over ten years since the creation of my first painting, Healing the Waters of the Earth, changed the trajectory of my life. That painting was created with the intention of bringing into the world a piece of art that significantly contributed to the healing of the waters of our planet. It quickly became apparent that Healing the Waters of the Earth is truly energetic in nature, holding frequencies that influence water in all its forms, including that held within the structure of the human body. 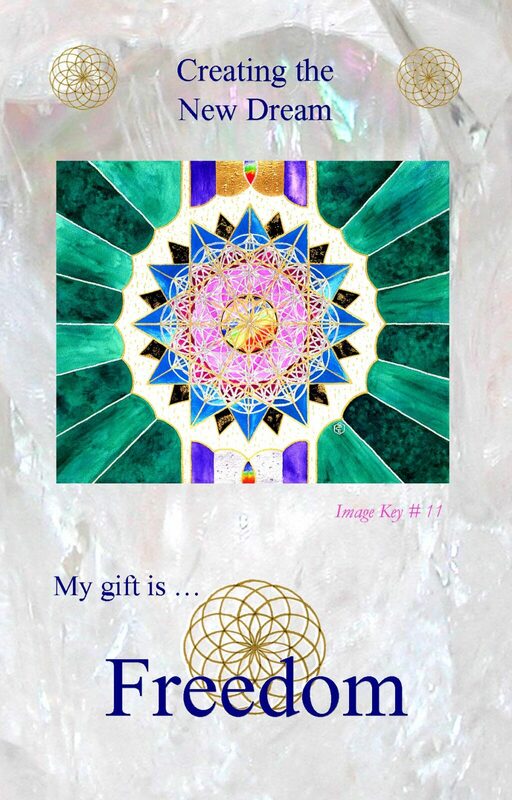 For me it was a door opener, opening the way to deep personal growth and to the creation of further paintings, which I call Image Keys and New Earth Chakra Keys, all based on sacred geometry designs imbued with the energies of crystals and sacred sound. This art holds frequencies of the higher dimensions, which I think of as the frequencies of Eden. It is art with a purpose… art to assist the raising of consciousness… art to help us awaken our inner essence and true potential… art to help us find our life purpose. These are the energies I choose to bring into my experience this year! As I continued to contemplate, I set the intention to fulfil my Potential for 2014 in alignment with Divine Love and my Life Mission… through JOY, Playfulness, Success, Passion and Inspiration. 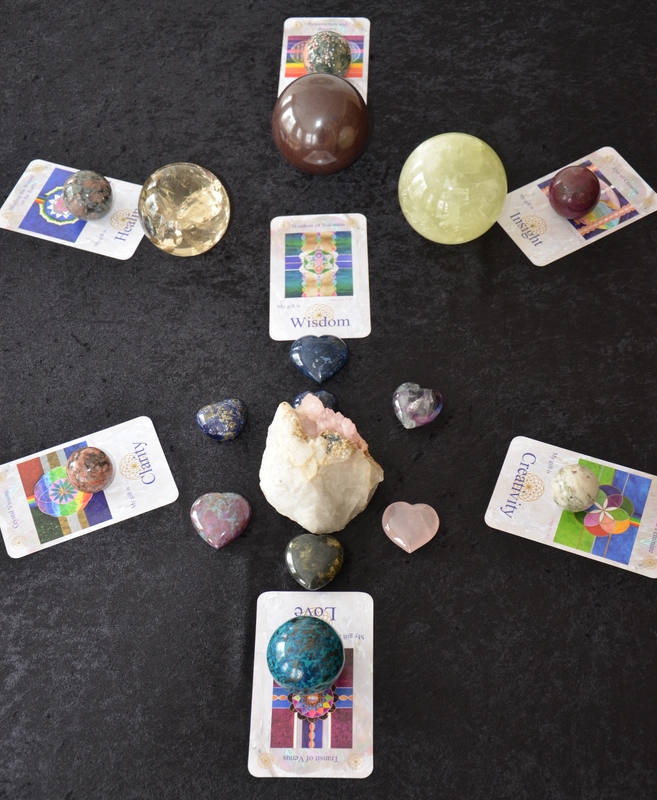 This led me to create a simple card reading with the Messages of Universal Wisdom Empowerment Cards and intuitively chosen crystals, to bring a focus to the energies of this year… it is a message not only for myself – it is also for YOU! 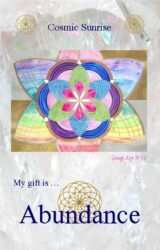 The Empowerment Cards are based on my Image Key paintings and the essence of each Image Key is captured by a Key Word. Starting at the top of the photograph, move around the circle of six cards and then finally arrive at the central card; think of it as a sequence or story, leading you to the central gift for the year. You are invited to spend a few moments contemplating the photograph before reading the messages of the cards. Now, begin with the first card, Balance (its keyword in the photo is hidden by the red hematite sphere). WISDOM… Imagine Golden Light surrounding you, assisting you to expand your consciousness and activate deeper levels of your true self, inviting you to be empowered by wisdom and to share your wisdom with the world. The overall message of my January 1st reading was uplifting and supported a feeling of lightness, anticipation and the potential for personal growth on many levels. 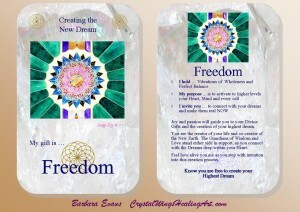 The Freedom card is a wonderful card, as it lets us know, without a shadow of doubt, that we are the creators of our life and that we are free to create our Highest Dream. It encourages us to be conscious of feelings of Joy and Passion as they rise within our Hearts, and to use them as trustworthy guides to light our way through the year. So finally, ask yourself … What are your dreams? What brings JOY to your heart? What small steps can you take to start the manifestation process of bringing those dreams into reality? It is a year of great potential… I send you Love, Blessings and Encouragement to connect with the JOY held within your HEART, and the courage and inspiration to fulfil the potential that this year holds for you! On December 15, one day after the tragedy in Connecticut, two very clear messages were delivered to me, and I feel compelled to share them with you. The first message came from a dear friend arriving at Crystal Wings Studio for a gathering. Trish rushed in… I have a message for you… your artwork needs to be in our schools, the children need the support of these energies! She added that ambassadors will step forward to help facilitate this; ambassadors for the Image Keys. Trish could feel that one image in particular will help the children feel safe… and said I would know which this is. I guided Trish and her friend Lorna to stand in front of Children of Light, Image Key #19 … we all knew it was the “one”. Archangel Michael is a guardian of this image, and he is known as the Archangel of protection. Children of Light holds energies which represent the fullest expression of our inner divine essence; it represents our energies before coming into this lifetime. and those we will still be when we leave. Many children present in the world today have exceptional gifts, and they are very sensitive to subtle energies. In my experience these children recognize the frequencies and vibrations radiating from Children of Light … the energies feel comforting, and feel like home. This was beautifully demonstrated recently when a young girl, maybe around 8 years old, came into my booth at an Expo in Minneapolis. I asked her which was her favorite of all of the paintings, and she immediately chose Children of Light saying it made her feel like she was all curled up in a warm and cozy blanket. The second message came later in the day when I was a guest on Linda Strasburg’s Lights-On Network Radio Show. Linda asked me how my work could help the children. She stressed that even very young children are aware of what happened at the Sandy Hook Elementary School, and her concern is the great potential for children all over the USA to be adversely affected as they connect with the tragedy, fear and pain. Awaking the next morning, three more Image Keys clearly stepped forward as having frequencies and vibrations to assist our children feel safe within this world. They are Image Keys to help them heal emotional wounds and keep their beautiful young hearts open so they can truly be who they are. These three Image Keys represent HOPE, LOVE and PEACE. HOPE … Image Key #22, Earth Star: Crown of Hope… helps all children to connect energetically with their highest spiritual guides, their guardian angels and their own Divine Essence. Crown of Hope brings HOPE into all our lives. LOVE … Image Key #20, Earth Star: Heart of Love… helps to release the deepest wounds held within our hearts and replace that with Universal Divine Love. PEACE … Image Key #23, Earth Star: Root of Peace… radiates powerful frequencies of Divine LOVE to help us to feel safe in the world and bring feelings of PEACE. It is with Hope, Love, Peace and Protection that I share this message with you. I know, within my heart, that these Image Keys can make a difference through raising frequency both within and around us. Contemplate the four images above; feel and connect with their energies … imagine drawing the gifts of Hope, Love, Peace and Protection deep into your heart. Allow the images to raise your frequency, and then breathe these energies out into the world! If you have children, invite them to do the same. We are all so much more than we have traditionally been led to believe… we are all magnificent Spiritual Beings experiencing life in a physical body! For many of us on the planet at this time, the opportunity, the challenge and the excitement is to AWAKEN aspects of ourselves which have always been present within us, but have been sleeping. Everything we need is within us… we are children of the Divine Creator… we simply need to activate what we already carry, and connect with our passion and purpose in life. In order to awaken our full potential, we need to raise our frequency… this means shifting from a place of fear, anger and pain to Love, Peace and Joy. As we make this shift, our frequency rises and so does our level of consciousness. 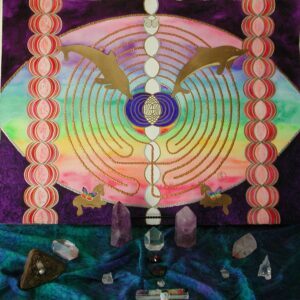 The Image Keys are a series of channeled images based in Sacred Geometry and Crystal Energies, guided by Archangels and painted by myself, Barbara Evans. These images are both my passion and my life work; they have been brought into the world at this particular time to assist Humanity to “Transform” through Awakening to our Full and True Potential. The Image Keys contain within them codes, to help us awaken the parts of ourselves that have been sleeping. The codes help us to release our fear and pain, at the same time we begin to get in touch with our passions, our gifts and our joy. This awakening process happens in steps and stages, so that we can make these important adjustments at a rate that feels comfortable to us. The simplest way to work with the Image Keys is through the Messages of Universal Wisdom: Empowerment Cards, which incorporate eighteen images with accompanying key words and inspirational messages. Furthermore, they are easy to carry and can be available at any time. 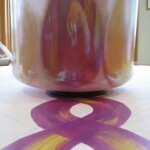 For those who have never worked with an inspirational Card Deck on a daily basis … it is actually very simple … and fun! Shuffle the 36 cards that form the body of the card deck. Which Card will best support me through my day today? What do I most need to know? Which card offers the antidote to this particular challenge I am experiencing? 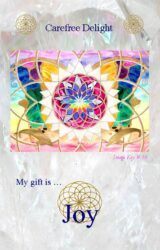 My question this morning (August 4, 2012) … What is the message that the Empowerment Cards have for the readers of this Blog? The Card that stepped forward is Freedom… Image Key #11… Creating the New Dream. This is a very powerful message… Know you are free to create your Highest Dream. The vibrations that this image radiate, assist us to connect with the inner knowing that we are the creator of our life… and provide energetic support as we allow joy and passion to guide us to our Divine Gifts, discover the role these gifts are to play in our lives, and then bring our highest dreams into manifestation. Creating the New Dream is a major player within the Image Keys and I am delighted that this is the message for all of you reading this blog!!! Creating the New Dream holds great support from the Archangels … Archangel Raphael channeled healing energy into the deep green background. Archangel Michael, well known as the Archangel of protection, channeled blessings into the golden flecks within the white surrounding the central geometry. 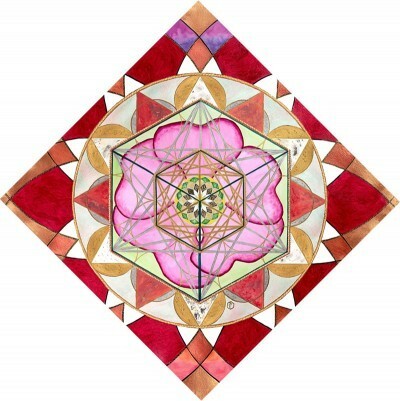 Archangel Ariel channeled beautiful vibrations into the pink found close to the center. Archangel Metatron added his energy within the radiating platinum rays. The blessings of the Divine Father are found within the gold, top center, the Divine Mother in the silver, bottom center, and St Germain within the purple. Many people have fallen in love with this Image Key and it is one of the most popular prints for homes, healing centers and businesses. December 2012 is the end of a 26,000 year Grand Cycle and the beginning of a New Grand Cycle. It is a time like no other, and we have an amazing opportunity to Awaken, and to create Peace, Beauty and Joy, both within our own lives and within the world. 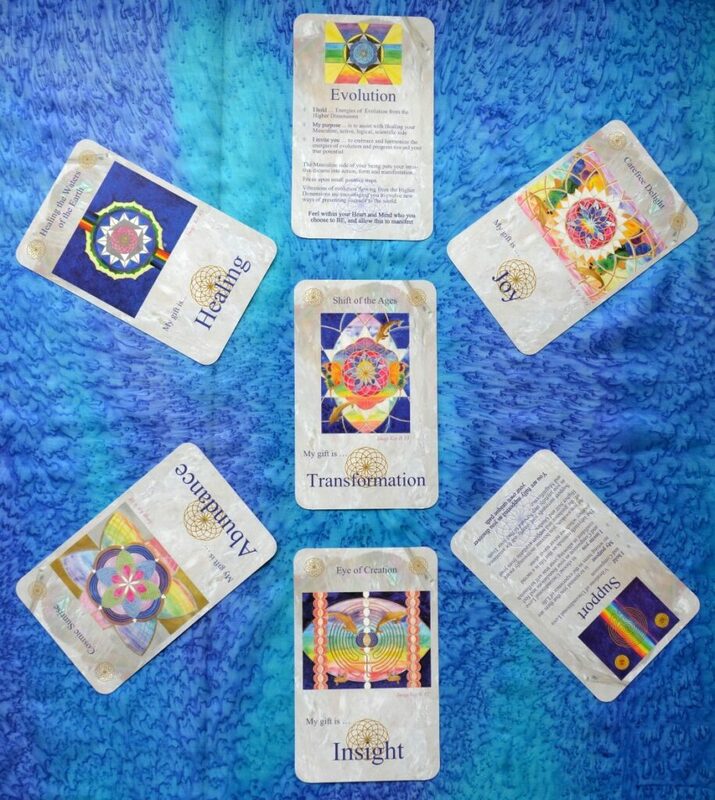 Many tools are available to assist us with this process… the Image Keys and Messages of Universal Wisdom: Empowerment Cards are my contribution – I hope you will enjoy them, and benefit from them. If you want to know more, there is a vast amount of information within the Crystal Wings Healings Healing Art website, including a calendar of Workshops, Expos and Presentations. I will also be participating in “A Course in Courage Victory Tour”, details of which are to be announced soon. I encourage you to follow us on Facebook, and if you have specific questions please email Barbara@CrystalWingsHealingArt.com. As with all of the Image Keys, the guidance for Earth Star: Eye of Awakening came in pieces for me to collect and weave together over what became a twelve month period. From the beginning it was clear that the paintings for the 2nd and 6th Chakras were to be a pair… and indeed their drawings were started on the same day, March 20, 2011 – the day of the Spring Equinox and a Full Moon… described as a day when the Platinum Ray brought new codes to the Earth and enhanced access through to the 12th dimension. The next step for Eye of Awakening took place on 12:12:2011. This was a day of important alignment with the Golden Light and Divine Love of Christ Consciousness. These energies anchored into Eye of Awakening support the awakening of our 12 stranded DNA and the activation of our 12 Chakra System. 12:12:2011 was the beginning of a paradigm shift which will continue throughout 2012. 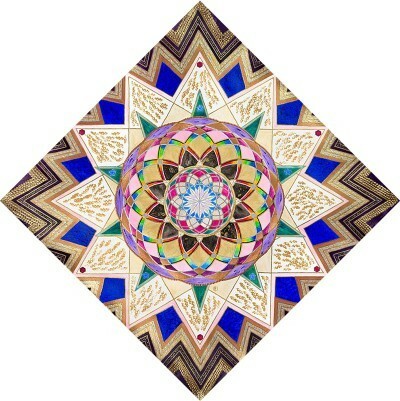 The central symbol of Eye of Awakening is the “Divine Unity” symbol. The gold areas carry the vibrations of purest gold, the white of Selenite, yellow the vibrations of White Gold, blue the vibrations of Celestite and the purple connects us to St Germain and the Lemurian Temple of Rejuvenation . The helix which extends from the “Divine Unity” symbol is 12 stranded and carries the energy of the Divine Mother… its energies activating to all layers of our DNA. Archangel Michael, Archangel Metatron and two Golden Dolphins, who have revealed their names to be Thoth and Serapis Bey, have all contributed to the energies and creation of this piece. New crystals stepped forward to bring their unique frequencies into the alchemy of the piece… most significantly Auralite 23, a crystal completely new to me until January of this year when I discovered this magnificent being at the Tucson Gem Show. 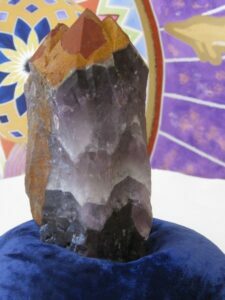 The energy and Essence of the Auralite 23 crystal shown below was channeled into the background of Eye of Awakening. I bring remembrance of who you truly are… and yes this is a common phrase… but I truly mean it! I remind you of your Divinity and help you awaken your full compliment of DNA… all the layers! I help you to take steps on the ladder that hereto fore have been impossible for the regular “human”… you are being invited to walk in the steps of the Masters, one small step at a time. This is your opportunity so “Go for It”. I am honored at the key role I have in this New Earth Chakra Key and I will do my utmost to play my role to the full… to help you and all of humanity to awaken their Divine Essence and experience it in their everyday living. I carry the wisdom of the Earth and ensure that as people connect with this key they expand and yet stay grounded and connected. They bring their gifts, their essence, their Divinity into living Being within their physical body and Rejoice at the miracle of it all… Blessings to you and all of Creation. 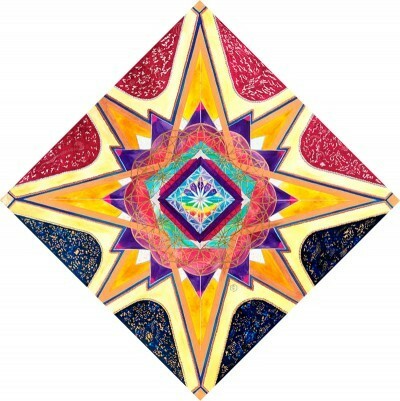 Now just a few days before the Venus Transit this New Earth Chakra Key … Earth Star: Eye of Awakening has been released into the world! You are invited to bring these transformational energies into your life and allow the alchemical unfoldment to emerge! From the beginning of my creative work with the Image Keys it was clear that one of their many functions was to bring balance to Masculine and Feminine energies. We each carry both Masculine and Feminine attributes, whether we are male or female. The Masculine attributes are associated with action, logic, mathematical and scientific thinking; they are “giving” and “moving out” into the world. The Feminine attributes are creative, nurturing, intuitive; they are “receiving”, and are connected more to the heart than the mind. Both are strong, yet in very different ways. There has been an imbalance of these energies within the world for thousands of years. There has been distortion of the expression of their purest form, and this has been reflected by an imbalance within us as individuals. At this time in the evolution of Humanity, there is an opportunity and crucial need to bring balance… both to ourselves and to the planet. There is an opportunity to heal the Masculine aspects of ourselves and reclaim the Feminine. We are being offered an opportunity to bring these two fundamental energies together, to enable us to move forward in our personal growth with courage, honor, integrity, grace and intuition. A powerful example of this is found in the two Amethyst crystals used in the creation of Image Key #17, Eye of Creation… both polished pieces of Amethyst are “Casa Crystals” charged by John of God. As they came into my life I had a knowing that one carried Feminine energies and the other Masculine. Energy of the Masculine Amethyst, on the left, was channeled into the upper half of the purple background, while energy of the Feminine Amethyst, on the right, was channeled into the lower half. It is clear to me that my work has been guided by Beings representing both Feminine and Masculine energies within creation… Mary Magdalene, Quan Yin and Isis have become almost constant companions as have Jesus, Buddha, St Germain and Poseidon. The Image Keys challenge us to evolve; they support us as we strive to activate more of the potential that exists within. They assist us to activate to higher levels our 12 stranded DNA and thus our Consciousness. You are invited to enter the next steps in your journey of Awakening through the balancing of Masculine and Feminine with the quantum vibrational energies of the Image Keys as your constant and supportive companions. Which Image Speaks to your Heart and Soul? As we have worked over 6 months to create our new website, the underlying concept was to reveal more of our essence… who we are …what the Image Keys are, and why they are coming into existence now at this very crucial time in the evolution of Humanity and the Earth. 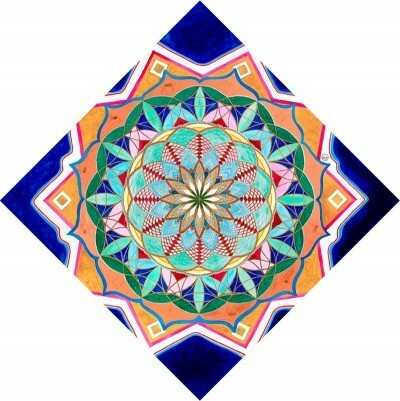 Our intention is to create a community, a feeling of connection and friendship, a place where people come to experience high vibrational energies that inspire awakening and feel they belong… also be sure to check out the magnifying tool in the shopping section as it gives the best view of the individual Image Keys so far created on the computer. To help us achieve these intentions and help you become involved, we are starting a blog, Facebook and newsletter which we hope you will enjoy… let us know what you want… how can we make this a great experience for you! 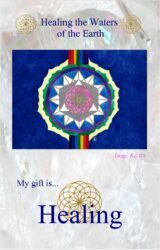 At least one additional New Earth Chakra Key launched during 2012! The first Crystal Wings Healing Art Practitioner Intensive in September. For those already practicing a healing modality, this will be an opportunity to learn how the beneficial healing energies of the Image Keys can be incorporated into their healing practice. This will be held at the Crystal Wings Studio, Richland MI, in a beautiful environment on a spring fed lake. The launch of a Golden Dolphin Pod…read more about Golden Dolphins.